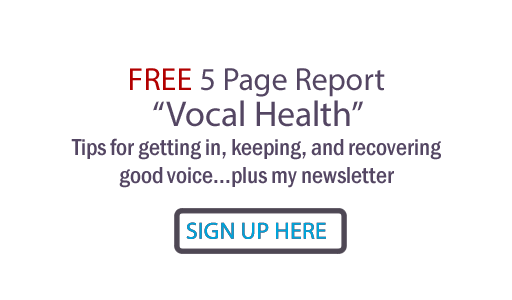 Judy Rodman - All Things Vocal Blog: A Sneaky Source of Vocal Tension... Dehydration! A Sneaky Source of Vocal Tension... Dehydration! Even if you're just a little short of water, your vocal cords will suffer to some degree or another, because your body doesn't consider them as first priority for scarce h2o. You can read my article about hydration and the voice at the H2O Overdrive site. 1. Drink a diluted solution of 25% pineapple juice (a little can of Dole's will do) and 75% water. The pineapple juice has enzymes that make the throat feel wonderful. 2. Drink one of the products they sell at the H2O Overdrive site. These formulations really are fantastic. I like diluting mine with water, about half and half. I keep them on hand for my own performances. 3. Hydrate yourself through steam before your performance (shower, hot bath, warm air humidifier). But the best thing of all to do is stay hydrated on a regular basis. A good rule of thumb I've heard from nutritionists is to take your weight, divide in half, that's the average ounces of water you should drink daily. Think this fix is too simple to be that important? "For The Want Of A Nail"
Thanks for the reminder. It is a simple thing, seemingly, but really not that simple (I find that in order to drink 2 qts a day I have to be constantly remembering to drink a cup of water throughout the day-- and usually have not been getting as much as I'd like). You might be interested in this book; I read it awhile ago, and thought it had some good info-- Your Body's Many Cries for Water, by F. Batmanghelidj, M.D. You know, I've been meaning to get that book. Thx for the reminder, I understand its wisdom is pretty timeless.